Okay, claiming this is the BEST green smoothie might seem a tad subjective, and possibly unbelievable to those who would rather chew on the bottom of a shoe for breakfast, but if you can hang in here for a few minutes you might be pleasantly surprised to learn what this funky green concoction can actually do for you. While some may be perfectly happy sticking with a bagel and cream cheese for their first meal of the day, I've noticed some positive changes since indulging in this morning ritual. Cravings for starchy, salty white flour foods have greatly diminished, and I pretty much stick to three meals a day with very little snacking. When I do snack it's usually on fruits, veggies, nuts, seeds, a hunk of protein or a leftover smoothie. I've also started making extra in the morning, so my daughter can have it when she gets home from school. She likes it, and seriously is there a parent on this planet who would object to this as an afternoon snack? Not me, that's for sure. 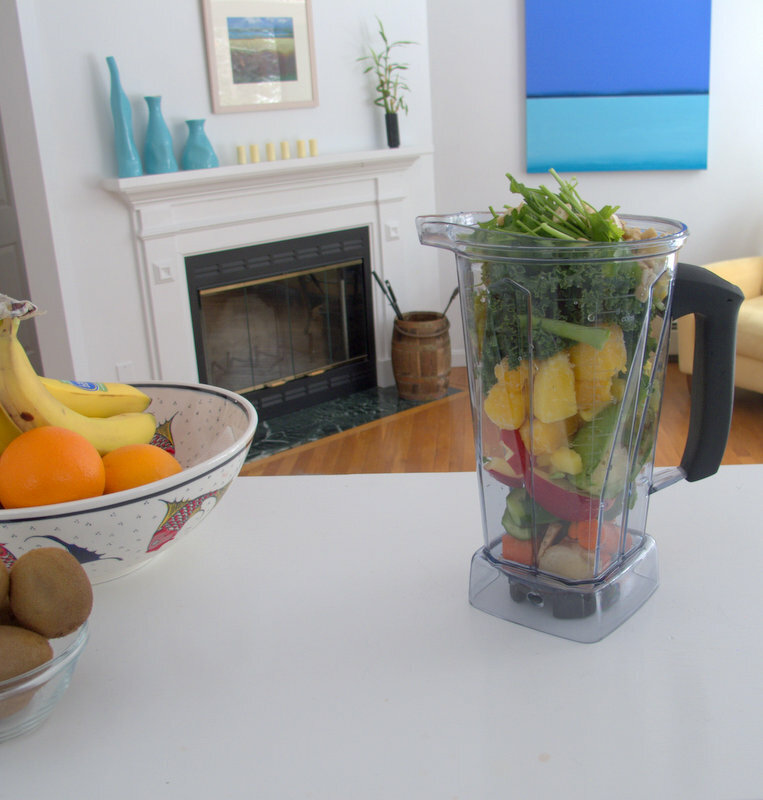 So are you ready to jump on the green smoothie bandwagon? Or are you hovering on the sidelines? Why not start out gradually by setting a goal to have one or two a week. As your body gets accustomed to this royal treatment, you'll probably ramp up the frequency. It's funny how that happens. Just for the record, I have spells when I fall off the beam a bit. While traveling it's not so easy to whip one of these up, so when I get home it's usually the first thing I make. Yep, my body is craving the good stuff and I'm happy to oblige. Place all ingredients (I use organic fruits and vegetables) into your blender ( I use the Vitamix). Toss the harder fruits and veggies in first and the greens on top, then the liquids and ice. Begin blending on low speed. 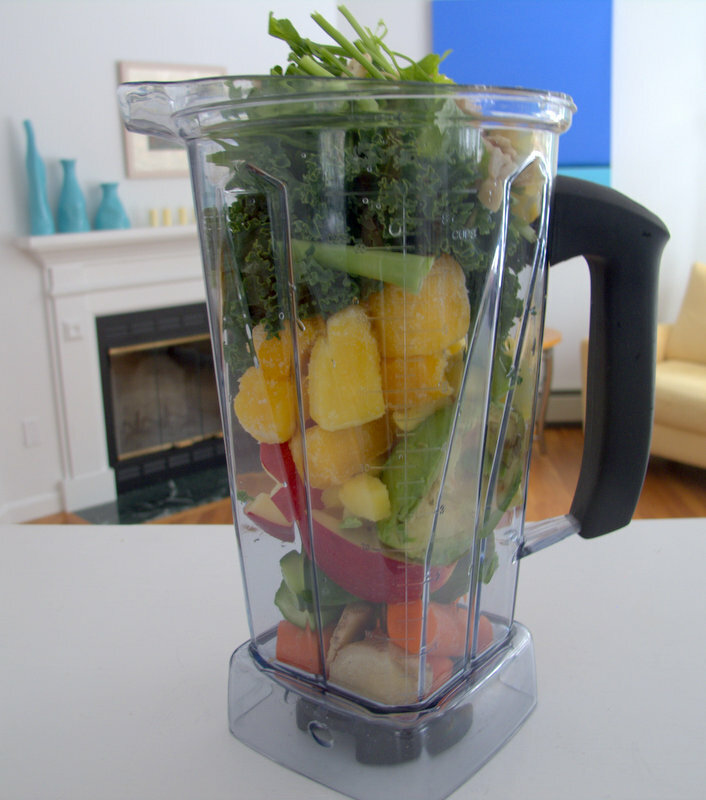 As the smoothie comes together switch to high speed and blend until it's smooth and creamy. About 30 seconds. Enjoy!